The best way of managing trees and forests for climate change and accounting for contributions of forests and forestry activities in carbon budgets remains hotly contested. Forests can either take up carbon dioxide (CO₂) or release more CO₂ into the atmosphere. Wood can substitute fossil fuels or energy-intensive materials, but forests are also large carbon reservoirs that add emission peaks if disturbed. The atmospheric concentration of CO₂ has increased from a pre-industrial 280ppm (volume parts per million) to just above 407ppm – and will reach 550ppm by 2050. As the main greenhouse gas, CO₂ drives human-induced climate change. Most global CO₂ emissions come from burning fossil fuels, but net deforestation still adds about five billion metric tons of CO₂ per year. Global deforestation is mainly determined by large-scale clearing of tropical forests, still progressing at some 3m hectares a year. In contrast, European forests have been cleared over many centuries and are now expanding, having grown by about 11m hectares since 1990. Regrowing forests on deforested land creates carbon sinks which remove CO₂ from the atmosphere. Wood can reduce carbon emissions by being substituted for materials such as cement or metal, and replacing fossil fuels in energy generation. The CO₂ released when wood is burnt can be recouped by planting new trees, making wood a renewable source of energy. Accounting for forests and forestry activities in carbon balance sheets is a controversial task. For example, the amount of timber harvesting that can be seen as sustainable is regularly contested, even among European countries. The increasing use of wood fuels in energy generation is also creating debatable outcomes. Such controversies often boil down to a choice between locking up the existing carbon reservoirs in trees and forests, or growing forests into wood products that replace fossil fuel-intensive alternatives. Young, rapidly growing forests remove atmospheric carbon quickly, but have relatively small carbon reservoirs. Ageing forests capture carbon at decreasing rates, but build up large carbon reservoirs in biomass and soils. 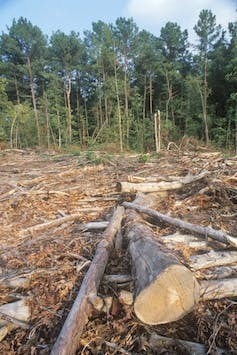 When an older forest is logged, not only the wood is removed, but carbon from unused biomass and soil is also released back into the atmosphere, creating a “carbon debt”. Especially large, old trees store most carbon, but are often over 100 years old. Repayment of the carbon debt may, therefore, take a long time. 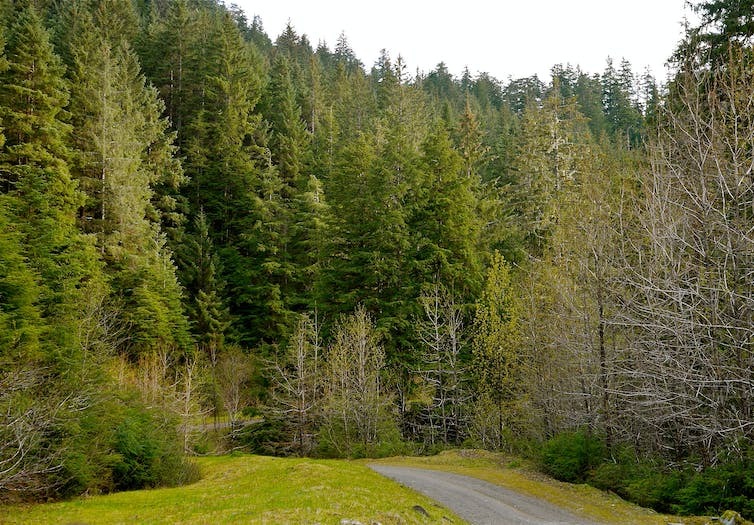 Theoretically, older forests reach an equilibrium, when carbon taken up into new growth is balanced by carbon released through decomposition processes. But this has been proved wrong. Even 800-year-old forests still continue to take up carbon, and, perhaps more surprisingly, individual large, old trees maintain high growth rates, too. Old forests are not only large carbon reservoirs worth maintaining, but actively continue to capture atmospheric carbon. There are risks. First, we do not know for how long mature forests will continue to soak up additional CO₂ as atmospheric concentrations increase further and push forest ecosystems even faster into unchartered territory. 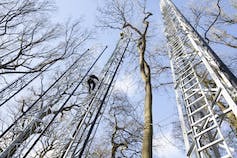 To study mature forests in a future atmosphere requires large-scale experiments such as the Free Air CO₂ Enrichment (FACE) programme initiated by the Birmingham Institute of Forest Research. Only such elaborate (and rather expensive) technological marvels can supply the real-world data needed to answer this question. Second, large-scale disturbances such as bushfires, drought dieback or pest epidemics, stop trees from taking up more carbon and also mobilise carbon from soils and decaying or burning trees. For example, forests in British Columbia, Canada, have turned from a carbon sink to a net carbon source following large-scale outbreaks of a native pine beetle. Very little is known about how environmental changes and rising CO₂ affect the vulnerability of trees and the resilience of forest ecosystems. On the upside, in a country with low forest cover such as the UK, any sensible reforestation (avoiding bogs) is beneficial for carbon balance. Yet managing forests solely for their carbon benefit would miss the point. Especially older trees and forests provide a host of services, including biodiversity, flood mitigation, clean water and human well-being benefits. Any policy incentives must aim at balanced outcomes for all forest goods and services. Incentives that commodify one service but not others, too often create unintended consequences. Where forests are concerned, such mistakes are expensive, because it takes a long time to reverse adverse effects on old trees and forests.